FOUR GENERATION TEAM — Bill Spiegel (right) had a four-generation team in the Dave Spiegel Memorial Tournament. They included, l.-r., Zach and Jared Spiegel, both of Columbus, and Bill’s son, Jim Spiegel of Kearney. It was a good time for a great cause. 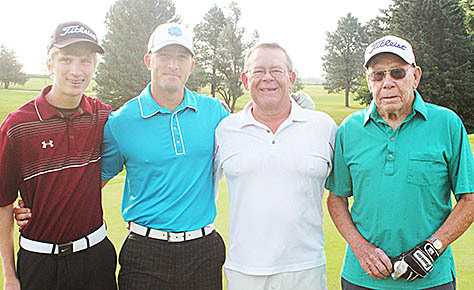 Golfers representing a wide area of Nebraska gathered at the Albion Country Club last Saturday, Aug. 27, for the third annual Dave Spiegel Memorial Golf Tournament. The tournament was completely filled, with 116 golfers making up 29 teams. All proceeds from this tournament are used to assist Boone County cancer patients. This year, a total of $13,500 was raised for this purpose. The tournament is in memory of Boone County Sheriff Dave Spiegel, who lost his battle against brain cancer in January of 2014. Oldest golfers participating this year were Bill Spiegel, 90, and Linda Spiegel’s uncle, Lefty Tinius, 88.